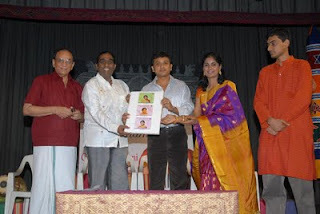 On Saturday 29th Aug, 2009, Isai Payanam DVD Volumes 8, 9 and 10 were released at a function held at Bharatiya Vidya Bhavan, Mylapore. This release function was followed by my Isai Payanam concert. The DVDs produced by Giri Trading Agency were released by well-known singer Sri P. Unnikrishnan and the first copies were received by noted music director Sri Dhina. Actor Sri ARS was also present on the occasion. Volume 8 contains ragas Subhapantuvarali, Madhyamavati, Brindavani and Brindavanasaranga. Volume 9 contains Abhogi and Kapi ragas and Volume 10 contains ragas Kaanada and Darbari Kaanada. Sri Unnikrishnan congratulated the effort of Isai Payanam to promote classical music among a greater cross- section of audience. Sri Dhina stressed the importance of classical music and highlighted the role that classical singers like MS, Madurai Somu and others have played in enriching film music from those days till today. He also stated that he liked watching the television episodes of Isai Payanam and said they were very entertaining and informative. The function was followed by my concert in which I presented ragas Sahana, Maand, and Bagesri which was enjoyed by the packed auditorium full of eager rasikas. Seen in the photo (L to R) – Sri ARS, Sri Dhina, Sri P. Unnikrishnan, Smt Charulatha Mani and Sri Karthik Bala, Trustee, Isai Payanam Trust. Hope you all had lovely Krishna Jayanthi celebrations, despite the minor hassle that the swine flu scare created. 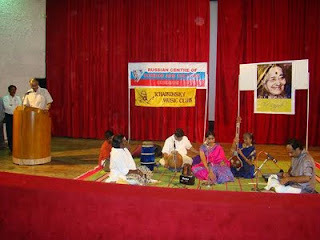 On 13th I performed at the IKSCON Temple here in Valmiki Nagar Chennai for a private audience, very calm experience. On 14th was the day I have been looking forward to for the past few months now. Isai Payanam Trust, founded by me, was officially launched on the 14th of August. On this occasion I presented a Janmastami special concert dedicated to the life and stories of Lord Sri Krishna. I presented well loved kritis, bhajans and abhangs, interspersed with interesting anecdotes from the Bhagavatam and some verses with meanings from the Bhagavat Gita. I was totally taken in by the spiritual power that prevailed on the stage that day, and my audience were also drawn in. It was a warm, and fulfilling experience. Some of the most memorable renditions were that of "Ganamurthe" - Thyagaraja in Ganamurthi raga, "Sri Parthasarathy" by Dikshitar in Suddha Dhanyasi raga, "Krishna Nee Begane" in Yamunakalyani, "Jagadhodarana" - Pilu, and the Abhangs. This morning was spent at the floors of SUN TV where I shot for the Vijayadasami Special program on songs of Durga, Lakshmi, and Saraswati. In the evening I sang for a film called "Aaraam Vidhi" music by newcomer Haribabu from Bangalore. Nice peppy tune sung by "Madura Kulunga" (Subramanyapuram fame) Velmurugan and myself. Lots of love, take care and protect yourself from the swine-flu. Try not to touch your face when you are out at public places. Wash up thoroughly after coming home. 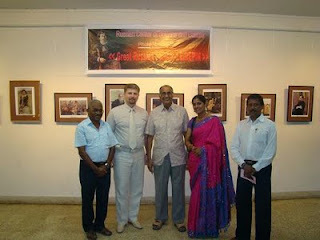 Concert in honour of DKP, Balaram Jayanthi, and Repin's paintings. The past week has been an eventful one. 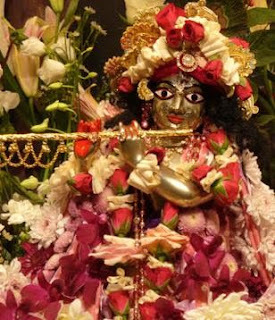 On Wednesday Balaram Jayanthi Celebrations went off in full swing at the Hare Krishna Temple, and I sang kritis and bhajans in praise of Narayana after the abhishekam. It was very fulfilling, I experienced ecstasy as Harinama escaped my lips and took the form of music. On Friday, the 7th of August I performed a concert "Tribute to the legends MS, MLV and DKP" dedicated to the memory of Smt D. K. Pattammal who passed away recently. The concert was held at the Tchaikovsky Music Club, Russian Cultural Centre, and was very well received. "Eppadi Padinaro" and "Bhaja Govindam" were the highlights. Prior to the concert Mr. Simakov, Consul General of Russia, and myself inaugurated an exhibition of the paintings of the great Russian painter Repin. Lovely paintings, "The Unexpected Visitor" and "The Lady in the Fields" are masterpieces. Very natural. Saturday was spent at Kagithapuram, Karur district where I judged the music competition held by TNPL. With me, judging, was TRM Savitri, daughter of the great T. R. Mahalingam, and it was very nice to share with her reminiscences of her father. I believe TRM was a very jovial and jolly person, and very soft spoken. I'm making preparations now for the Janmastami special concert at R K Swamy Auditorium, Mylapore on the 14th of this month at 6:30 pm... Do attend.